Q How do you analyze the current political situation of the country amidst talks of government instability? The government is acting against the mandate it received from the general public on January 8, 2015. Had the people anticipated the current nature of affairs, they would have never voted for this government. In the installation of the current rule, people defeated a charismatic candidate who ended the 30-year war and brought about radical economic development. People would have never expected the current predicament by defeating such a figure. This government received a different kind of mandate called the ‘Yaha Palana Government.’ It is required to be wholly democratic as such. It should be the embodiment of goodness. When the previous rule made giant strides in development, these elements, at that time, crowed over commissions perceived to be made by those who executed the projects. When the Norochcholai Coal Power Plant was commissioned, we could purchase electricity at Rs. 6 per unit rather than paying Rs.22 per unit for thermal power. These elements did not talk about this financial advantage. Instead, they voiced over perceived corruption. Negativities were highlighted repeatedly till they established in the minds of people over the years. Q Was it the sole reason for the defeat? An international conspiracy was hatched to defeat former President Mahinda Rajapaksa. First, they tarnished his image. Secondly, the party was split. They did both successfully. 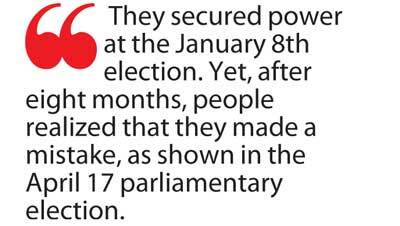 In this manner, they secured power at the January 8th election. Yet, after eight months, people realized that they made a mistake, as shown in the April 17 parliamentary election. Despite being in power for seven months, the United National Party (UNP) under the leadership of Prime Minister Ranil Wickremesinghe could not win even a simple majority. It means people had, by the time, realized that they made a mistake by unseating Mr. Rajapaksa. If not for the statements by President Maithripala Sirisena that Mr. Rajapaksa would not be picked for premiership, the results would have been different. Otherwise, people would have elected Mr. Rajapaksa as the Prime Minister. No party received a clear majority finally. President Sirisena, perhaps with good intentions, formed a national government. Yet, 54 of us decided to sit in the opposition. We realized that the government could not proceed as the policies of the UNP and SLFP were starkly different. Left wing and right wing policies cannot be reconciled. The SLFP base lies with the middle and lower strata of society. Without protecting them, we do not have a way forward. The President has an SLFP upbringing. The Prime Minister is an authentic UNPer. An alliance between the two is not practical. What has happened today? The economy is in tatters. The country is politically unstable. Public wealth is being plundered. It amounts to daylight robbery. Today, there is a serious conflict between the President and the Prime Minister. Q The government has earmarked plans to establish investment zones in the country. 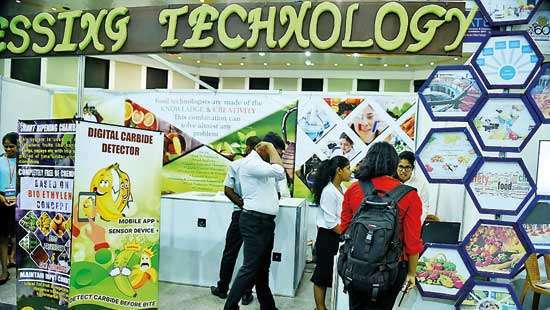 Already, it has been announced to allocate 15,000 acres in Hambantota for it. The government has promised to deliver this by 2020. How do you respond? I wonder how the government talks about Hambantota development without any qualm. At that time, the UNP dubbed the Hambantota Port Project as something unviable. Today, it has been listed for selling at a much higher price than the amount spent for its construction. If it were not economically viable, how did it happen? Actually, the Prime Minister should have expressed his gratitude to Mr. Rajapaksa for developing it. The project’s feasibility is proven. Then, we have to ask why the government cannot run the project rather than selling it off. Why do they take five years to put up investment zones? It should not take that long. This is falsehood. It antagonized China, a country that can extend us the biggest volume of financial support. The government thought the countries such as the United States would rescue it economically. They criticized and sidelined China with this in mind. What happened? They did not get money from Germany, France or the US. The government will not do anything during its term. 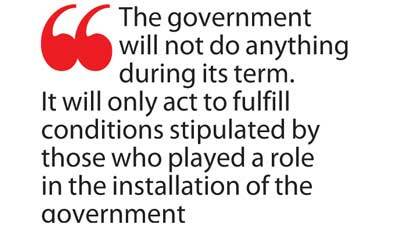 It will only act to fulfill conditions stipulated by those who played a role in the installation of the government. One is to devolve power to a unit comprising the North and the East. 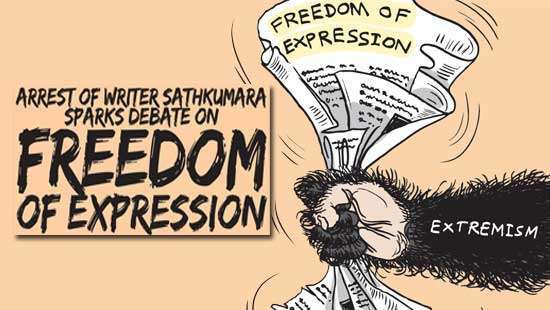 The other is to legally victimize Mr. Rajapaksa. To run the government, all the State resources will be sold off in the meantime. That is it. Q Initially, you said, the image of Mr. Rajapaksa was tarnished. Why did you fail to counter their propaganda then? Actually, we had overrated ourselves after the war victory and the economic development we achieved. Overwhelmed by it, we ignored such propaganda against us. I was accused of various frauds after this government was formed. Yet, I stand firmly against the government and continue to attack it in all fronts. I have come out with the ‘Top Ten’ persons responsible for frauds in the government. Q How does the JO manage the current political situation? If not for the JO, the government would have enacted the new Constitution compromising the unitary status, and signed the Economic and Technology Cooperation Agreement (ETCA). There would have been more and more tax burdens. Today, there would have been no opposition otherwise. The official main opposition is cooperative of the government. The Tamil National Alliance (TNA) voted for the budget. 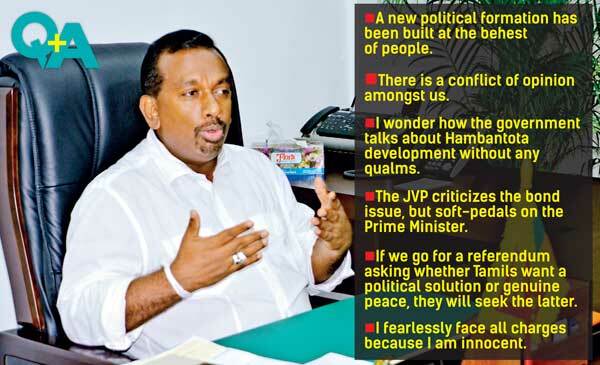 The JVP criticizes the bond issue, but soft-pedals on the Prime Minister. We want to protect the country first. We have appointed five committees under the supervision of Mr. Rajapaksa. We are mobilizing people against the government in all fronts. Unless the government is ready to listen to people, we will opt for toppling it in Parliament. Q How confident are you in securing the required number for such a change in Parliament? First, there is a crisis between the UNP and the SLFP. It means all members elected on the UPFA ticket are there. We have 95 members despite having some minor differences. We need to rope in only 17 MPs more. Q For it to happen, the President and former President Rajapaksa should join hands. How realistic is it? If the JVP and the TNA can get onto one stage for political interests, why won’t it be possible for the President and Mr. Rajapaksa to do it? Q How certain are you about it? Clearly, it is there. When looking at the manner in which the UNP is leading this country down the path of disaster, these two will get together for sure. Q You talk about such a possibility. Yet, a new political party called the ‘Sri Lanka Podujana Party’ has been formed with the backing of Mr. Rajapaksa. Then, how do you see it? Q There are reports that some SLFP MPs of the JO are opposed to the new party. What are your thoughts? Nobody is opposed to the formation of a new political force. Yet, it has to be done after correcting the mistakes we made in the past. We should not go before people with some old faces rejected by them. If we reach out to people with such rejects, our struggle will be blunted. We insist that our mistakes should be rectified. In this respect, there is a conflict of opinion amongst us. There are factors that contributed to our defeat on January 8, 2015. If we do not address them, there will be no use of a new political force. Q Who are these political rejects you talk about? We should not talk about them now. It is an internal issue. Most members of the JO hold that view. We have to get it on the correct track. It is not a big deal. We can sort it out. If a new party is to be formed, then there should be a proper discourse. We should undertake the new political journey on the correct path. Otherwise, we do not want to scuttle the process. Q In your view, what are the mistakes that caused the defeat of the previous government? First, there was deception of people with lies established over the years. 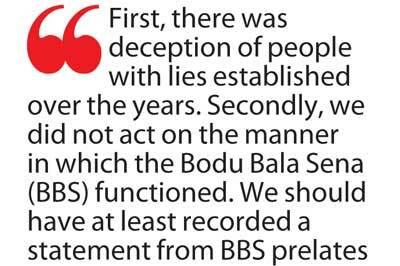 Secondly, we did not act on the manner in which the Bodu Bala Sena (BBS) functioned. We should have at least recorded a statement from BBS prelates. President Rajapaksa ended the war, did a lot of development in the North and restored democracy. Yet, we could not win over the confidence of the people there. There was a demand for the appointment of a civilian as the Northern Governor, instead of a retired military officer. We did not do it. What a sensitive issue was it! Those small matters cost us dearly at the end. Q In the North, people vote depending on political solutions offered. How can you win over people without that? It is untrue. I am a politician conversant in the Tamil language. Ordinary people in the North do not demand separatism. Only the TNA and a few other extremists demand it. Northern people seek freedom to carry out their daily activities. We understand the sufferings of Tamil people more than anyone else does. We know their pulse. In the post war era, they want to live in peace with economic development. If we go for a referendum asking whether Tamils want a political solution or genuine peace, they will seek the latter. Q Though you say it, Northern people have voted overwhelmingly for the Tamil parties that, at its core, campaign on a political solution. They have always rejected the UNP and the SLFP. What do you say about it? None of these two parties have done politics in the proper sense in the North. Though Mr. Rajapaksa ruled the country for ten years, we could not produce a breed of SLFPers. The UNP leadership also failed in it. We always counted on extremists forces. It is a mistake. After the conclusion of an election in the North, I proposed Mr. Rajapaksa to remove MPs Kamala Ranatunga, Malini Fonseka and J.R.P. Suriyapperuma from the National List, and instead nominate three youths representing three different districts in the North. I, along with MP Namal Rajapaksa, asked him to appoint three such youths as ministers to work for the North. We were not heeded. We abandoned the North in politics. We had overrated ourselves. 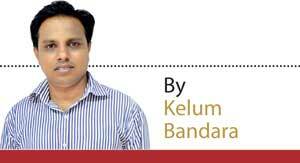 Q The previous government suffered a serious defeat in the Kandy District which you represent. Why was it? In our district, there are as many as 240,000 minority votes. It accounts for 30 per cent of total votes. 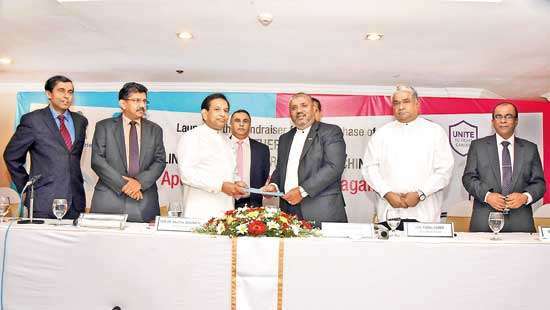 At the last Parliamentary election, Minister Rauff Hakeem polled 105,000 votes as a Muslim candidate in the UNP list. Tamil MP Velu Kumar received 70,000 votes. Yet, one of our Muslim candidates received only 3,000 votes and the other 4,000. I do not say we were defeated merely due to minority votes. We made mistakes. People got carried away by propaganda against us. Today, even the Muslims are disappointed with the government. Their businesses have suffered. Q You also face serious allegations. There are cases filed against you. How do you proceed? All these are cooked-up stories. These are charges cooked-up with political interests. I will stand up to these charges. Another case has been filed against me over the use of a land belonging to the railway authorities in Nawalapitiya. I have lawfully made lease payments for this land where one of my offices is located. Yet, I am charged. There are others who have not paid. But, they are exempted. I fearlessly face all these charges because I am innocent.